Aside from providing birth certificates, the National Statistics Office (NSO) also issues a certificate that is important for people who have plans of getting married. 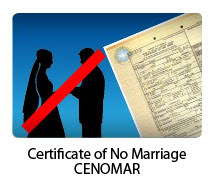 This certificate is called as “Certificate of No Marriage”, which is abbreviated into CENOMAR. The Philippine government, through the NSO, created the CENOMAR to remove the occurrences of fraudulent marriage. There are many cases where a married man married another woman without annulling the first marriage. In most cases, the “second wife” has no idea that her “husband” is already married. CENOMAR helps women from being tricked by bigamous men. Of course, there are cases where a married woman marries another man without annulling the first marriage. CENOMAR will help men in knowing if their bride is truly unmarried. CENOMAR can be obtained from the NSO by going to any of the NSO offices. You can also obtain CENOMAR by sending a request to Teleserv and e-Census. CENOMAR is not a required document for weddings, specifically Catholic weddings. However, there are parishes that require the submission of a CENOMAR for the groom and the bride as to ensure that the two persons will face the altar in good faith. So, if you are having doubt the person who you are about to marry, I suggest that you get his/her CENOMAR to see if he/she should be trusted or not. Looking for information on NSO Birth Certificate? Please read my post about NSO Birth Certificate and NSO Birth Certificate delivery. Visit Before the Eastern Sunset and read about my trip to Fremantle City, Western Australia.